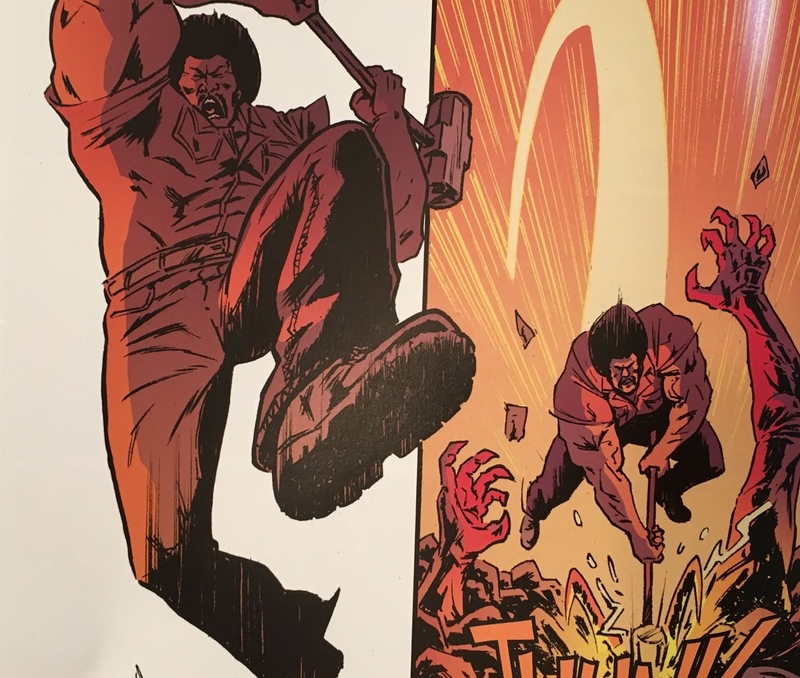 The thing that I appreciate about each issue of the comic book (written by Joshua Jabcuga with pencils by Tadd Galusha) is that each individual comic offers a unique, defined chapter in this story. Perhaps I've been trained by the current trend of decompression that single issues don't really matter as much as they used to, with many current comic issues often ending in the exact same place they started with no real story taking place between the covers. Refreshingly, Bubba Ho-Tep and the Cosmic Blood-Suckers burns up the pages with purpose. Each issue has been a unique and well-defined chapter, and each issue has also had its own feeling and vibe. Issue #1 was an introduction to the premise. Issue #2 set the stage for chaos. Issue #3 was full of action and served as a payoff for everything that had come before. Now we have issue #4, and once again, it offers something we haven't seen so far and serves as act four in a five act play. With this story set to wrap up with issue #5, I find myself dreading the climax because I'm not ready for this series to end. I feel like I'm just getting started with this premise and these characters, and soon I'll have to say goodbye, which has me staying at the Heartbreak Hotel. I honestly can't get enough of this younger version of Elvis the monster hunter and his fellow specialists. Each one of them could (and maybe should) receive their own mini-series: John Henry, the hammer-swinging descendant of the historic "steel-driving man" and a funky hero straight out of the blaxploitation scene, the musical sensation Jenny Jo Dallas, aka Raven, who is still in training but has charisma that compares to that of The King, The Blind Man, an albino with the power of second sight, and Jack, the logistics man with a gift for strategy. Then there's Colonel Tom Parker, the head honcho of this operation, who answers to Nixon, and Nixon must answer to someone. This is such a fully-formed world, just askew from the one we live in with a history we mostly recognize. Surely Elvis didn't fight the forces of evil at the behest of his manager, who took orders from the U.S. government...or did he? I'm completely invested in this premise and in these characters, and I'm sad that issue five is a wrap. Part of the fun has been meeting this group of supernatural warriors, and I feel like we just got this party started. Heck, we need at least two more comic book stories so we can call it "An American Trilogy." Issue four ends, of course, with a tease of what we're up against in issue #5 and I have no idea how this is all going to shake out. Jabcuga is adapting from Lansdale's original story (which remains sadly out of print--at least for physical book collectors) and has worked closely with the maestro, but the last four issues have proven that Lansdale isn't afraid to change what his playing field looks like. This is a compliment to his storytelling, because it keeps the reader on the edge of their seat, never able to take anything for granted. The only thing we know for sure is that Elvis is going to survive to fight another day, and that's simply because this is a prequel. When it comes to the Bubba Ho-Tep universe, it somehow baffles me that we've only had one film and one comic mini-series to date. This is such a rich, well-conceived world, it seems like the sky is the limit. Having seen the film and read 4 of the 5 chapters of this comic series, I've come to view this as the same sort of universe that Mike Mignola created around Hellboy, and it's ripe for the same wide exploration. There are so many different "hooks" upon which to hang stories: there are the obvious Elvis stories that beg to be told, but then there are also the origin stories of side characters; personally, I'm just dying for more John Henry. Another hook is the political intrigue, with the whole Nixon angle begging for further exploration. How was this infrastructure established? How far back does it really go? 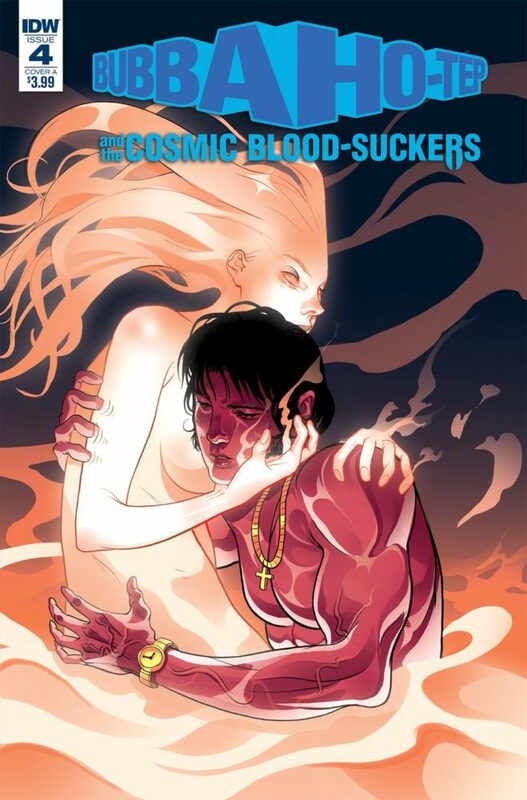 How about a story that sends Elvis back to Hawaii to fight darkness (Black Hawaii, anyone?)? I hope that IDW Publishing is aware of the potential inherent in Lansdale's creation, because they could take this world and these characters a very long way. Just from reading recent tweets from Joe R. Lansdale and Joshua Jabcuga, I gather both men are eager to keep this ball rolling, and I'm eager to keep reading. Bubba Ho-Tep hits me in a sweet spot and I can't help falling in love. It's a story that can be awfully dark and is deeply rooted in its horror premise, but there's a glee that makes it unique. Amid this darkness populated with cosmic creatures that deal out cruel and gruesome death, a psychedelic light shines into that darkness, a twangy Telecaster note that pierces the cacophony of suffering and offers safety, and something even more valuable: FUN. Bubba Ho-Tep combines Lovecraftian horror with sixties and seventies pop sensibilities, and that's the highest compliment I can possibly pay it. This title hits me right where I live in the best of ways. With issue #4 of Bubba Ho-Tep and the Cosmic Blood-Suckers, this hound dog is pulled ever closer into this story and to its characters. Long live The King.